Dallas Police Department Presents "Coffee with Cops"
2570 W. Red Bird Ln. 8055 S. Great Trinity Forest Way. Bishop Arts Theatre Center presents Denise Lee Sings Miss Simone a special North Texas Giving Day Giving Event & Concert featuring Denise Lee. The concert will feature songs made famous by Nina Simone and more who is the focus of the 25th Anniversary Season opening play, The Champion by Amy Evans. Join us on Thursday, September 20th at 5:30 for a reception and to make your North Texas Giving Day donation. At 6:00 pm, join us in the theatre where Denise Lee will deliver her take on the iconic music of Nina Simone. Following the concert, the BATC staff & volunteers will be on hand to help patrons with their North Texas Giving Day gifts. This Giving Event & Concert is free to the public and people are encouraged to make their donations to Bishop Arts Theatre Center at this Giving Event. The Dallas Arboretum invities you to be a part of our first annual Quinceranera Fashion Show to celebrate Hispanic Heritage Month. Hosted by Adriana Lopez, of Acceso Total, Telemundo 39. This event is FREE for all paid garden guest. Entertainment by Mariachi Aguila's de UNT, Ballet Folklorico Hispano de Dallas, fabulous food and door prizes. Deadline to sign up is September 7. No fee required to enter. Space is limited for this event. You must be 15 or 16 years old to participate. Must be accompanied by a legal guardian. You will receive 2 complimentary admission tickets. Banned Together: A Censorship Cabaret - A collection of shows and scenes that have been banned or challenged from performances in schools or in the public sector featuring our TNT (Teenagers And Theatre) apprenticeship students. Banned Together will spotlight works from shows like Rent, Cabaret, Fun Home, and Angels in America, this cabaret style evening highlights the importance of freedom of expression and freedom of speech. There is no cost to apply, and all business owners receive a full scholarship to participate if accepted into the program! You can log on towww.dcccd.edu/10ksb to learn more about the program in this area. Inspired by untold events in the life of music legend Nina Simone, The Champion is set in 1962 North Carolina where she and her band are held up by a snowstorm in a greasy spoon. As tempers flare and secrets surface, it seems the waitress at this small-town diner will soon be the only witness to a historic meltdown. Suddenly, the door swings open, and the famous outsiders discover they’re truly in unfriendly territory. A sharply drawn, exciting new play by Amy Evans that intimately portrays a cultural icon in the turbulent era during which she rose to fame. 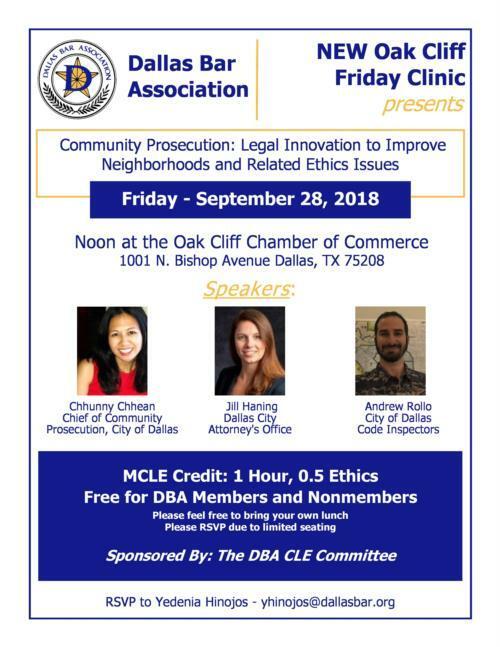 The event is sponsored by Heritage Oak Cliff along with five Oak Cliff Neighborhood Associations serving Oak Park Estates, Druid HIlls, Kiest Park, Creekside, Southern Hills and Wynnewood Heights. Please come out to hear the candidates and ask questions. 3900 Rugged St., Dallas, TX. 75224.